SALT LAKE CITY — Anglers across Utah and the country have embraced a program created by the Utah Division of Wildlife Resources and Trout Unlimited to educate people about the value of native fish and encourage them to explore new waters across the state, while also supporting cutthroat trout conservation efforts. The Utah Cutthroat Slam launched in 2016 at the Wasatch Intermountain Fly Tying and Fly Fishing Expo. Now during the third anniversary of the fishing challenge, representatives from Trout Unlimited and the Division of Wildlife will be back at the expo April 12-13 to answer questions about how to participate in the Slam. There is no time limit requirement to complete the Slam. Anglers have a day, a month, a year or a lifetime to catch each of the fish. However, participants must register for the Slam before they start their attempt. Registration costs $20 for adults and $10 for youth, and anglers can register on the DWR website. All but $1 of the registration cost is dedicated to conservation projects throughout the state. "We are really proud of the response. By all accounts, it has been wildly successful," said Paul Burnett, Trout Unlimited's Utah Water and Habitat lead. "Anglers should also be proud of the contributions they have made. Just by signing up, they have helped raise more than $30,000 to help fund native cutthroat trout conservation." More than a dozen conservation or education projects have received funding so far, benefitting all four varieties of cutthroat in Utah–including Bonneville cutthroat trout, the state fish. 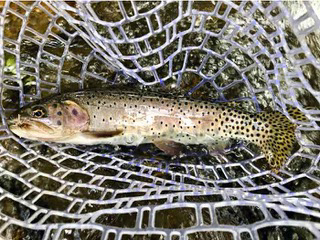 "We have enjoyed seeing Utahns and anglers who visit the state get excited about the Cutthroat Slam over the years," said Utah Division of Wildlife Resources Director Mike Fowlks. "While fishing is always a good chance to get out and enjoy Utah's beautiful outdoors, having a goal and receiving some recognition after reaching that goal can definitely add to the fishing experience. We hope anglers continue to have fun with this challenge year after year." The Intermountain Fly Tying and Fly Fishing Expo is being held April 12-13 at the Mountain America Expo Center in Sandy. Tickets are $10 at the door. Youth 14 and under are free with a paying adult.